Great food, cocktails and conversation—the inspiration behind Emily Baczynski and Mike Olek’s wedding—is also what first drew them together. The former coworkers instantly bonded over their many shared interests, “soon realizing that we basically shared a soul,” as Emily playfully puts it. And they’ve only cultivated that list since. The two bought their first house in 2017 on the West Side, and promptly filled it with house plants and parties. Their home proved the ideal incubator for exploring their mutual passions, from testing out new recipes on friends (and each other) to plotting the details of their next vacation. It also fittingly played backdrop to Mike’s proposal one October night a few months post move-in. After relishing that moment followed by dinner at Ristorante Lombardo, their next shared mission became their wedding. For these architecture aficionados, the Fontana Boathouse—the only one ever designed by Frank Lloyd Wright—was the pinnacle of their venue search. The building boasts serious design creds: University of Wisconsin commissioned it in 1905, but the boathouse remained unbuilt until 2007, when West Side Rowing Club was finally able to bring his plans to life. Plus, nestled along the water in the shadows of the Peace Bridge, its grounds offered the picturesque blank canvas the couple had envisioned. Emily and Mike then went to work transforming these solid bones into a full-fledged celebration entirely their own—one underscored by the shared passions that unite them. Craft cocktails were poured strong, scrumptious food was in abundance and good company was all around. 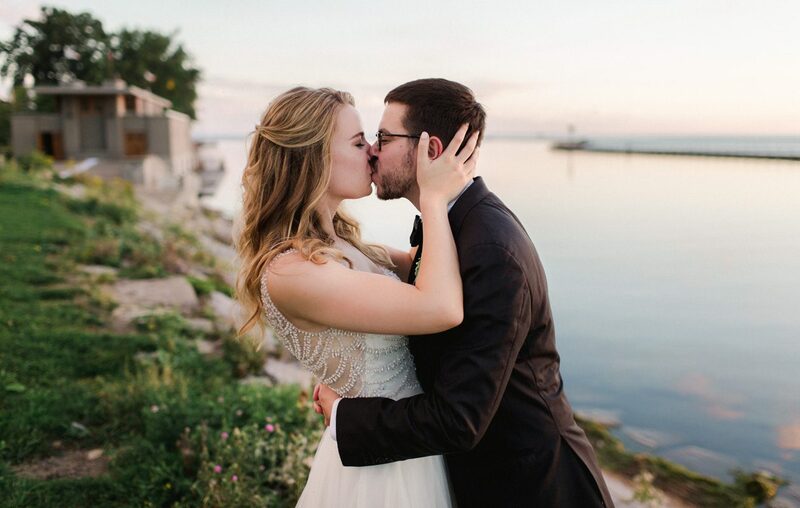 Its idyllic waterfront setting is one of the many reasons Emily and Mike were drawn to the Fontana Boathouse. Champagne greeted guests before the ceremony, which was backdropped by the quintessential Frank Lloyd Wright structure. “I’ll never forget the glowing, radiant smile on Em’s face walking down the aisle and having an explosion of joy rattle through my entire soul when she appeared,” Mike says. The evening festivities continued in a tent perfectly situated to treat everyone to a magnificent fall sunset. The two foodies took advantage of every opportunity to infuse their personal taste into their wedding. The mobile bar, Drambox, is the brainchild of the Ballyhoo and Lucky Day owners (two of their favorite bars). For favors, the cocktail connoisseurs worked with a friend to design and hand-bind mini books full of recipes. The couple didn’t want a traditional cake, but still wanted to have that moment—so they cut into one of their local favorites instead: Dapper Goose’s olive oil cake. The two also enlisted family to bake their signature cookies—and paired these confections with lotus blossom cookies from Gourmet Lao Foods and a variety of croissants from Butter Block. Along with their olive oil cake left in its beautiful, natural state, it added up to their dream dessert spread.